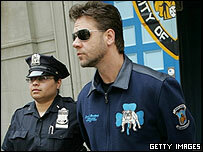 Oscar-winning actor Russell Crowe has been arrested in New York for allegedly assaulting a hotel employee. The Gladiator star, 41, is said to have struck the man in the face when he threw a telephone during a row at the hotel where he was staying. But the latest incident is nothing new to the actor who has gained a reputation as a Hollywood hardman both on and off the big screen. At the 2002 Bafta Awards Crowe admitted to being "abusive" and "behaving unreasonably" towards a TV producer who edited out his recital of a poem after winning the best actor award for A Beautiful Mind. But at the time of the incident, Crowe was unrepentant, saying it was about "passion" and not violence. In November the same year, he was spoken to by police following an alleged brawl with a New Zealand businessman in an upmarket London restaurant. And last year the star admitted attacking his own bodyguard at a drinks party, although they later made up. But while his behaviour away from the cameras has made the headlines, his name has continued to dominate film credits too. In recent years he has been nominated for three Oscars, an achievement that catapulted him to the top of Hollywood's A-list in a few short years. His uncompromising and dedicated attitude has also allowed him to throw himself into roles like rugged General Maximus in Gladiator - for which he won an Oscar - and tortured genius John Nash in A Beautiful Mind. He scheduled his marriage to Danielle Spencer in 2003 for the day of his 39th birthday, five-and-a-half years after his breakthrough into the big time. Born in Wellington, New Zealand on 7 April 1964, he is descended from Norwegian and Maori ancestry. His family moved to Sydney, Australia, when he was four, where his parents did catering on movie sets and often took their young son with them to work. Crowe was bitten with the acting bug from an early age and made his debut as a child extra at the age of six. His first professional acting role was in an episode of the TV series Spyforce. But at 14, Crowe returned to New Zealand to form the band Roman Antix. During his time as a young musician, Crowe took on several odd jobs, including that of waiter and bingo caller. But the acting took over when Crowe won a role in a stage version of Grease and then the Rocky Horror Show. After moving back to Australia, he also appeared in soap opera Neighbours. Crowe's first movie was Blood Oath in 1990 and his career gained momentum when he gave an Australian Film Institute award-winning performance in black comedy Proof the following year. That was followed by the critically acclaimed Romper Stomper, in which he played neo-Nazi Hondo and won another Australian Film Institute award. That performance got him noticed in Hollywood - particularly by actress Sharon Stone. The Basic Instinct star insisted that Crowe should play alongside her in The Quick and the Dead, which was followed by parts in films with Denzel Washington, Salma Hayek and Bridget Fonda. But it was 1997's box office hit LA Confidential that made the difference. Crowe played the aggressive officer Bud White, a performance that was rewarded with an abundance of offers and scripts. One of those was Michael Mann's tense thriller The Insider. As Dr Jeffrey Wigand, Crowe played a man who informed on the corrupt practices of his tobacco firm. 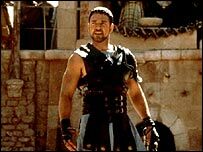 But if The Insider showed Crowe's maturity and conviction as a serious actor, it was Roman epic and box office blockbuster Gladiator that created the "cult" of Russell Crowe as action hero. His portrayal of the wronged military commander turned many female fans' legs to jelly and showed how he could captivate an audience. Four films have come since - the tense thriller Proof of Life in which he played a tough ex-SAS soldier turned kidnap-negotiator opposite his then-girlfriend Meg Ryan, and A Beautiful Mind. Since then he has starred in Master and Commander: The Far Side of the World and his latest film, Cinderella Man, has just opened in the US. Crowe was arrested while in New York promoting Cinderella Man - a biopic based on the life of 1920s world heavyweight boxing champion James J Braddock. The Ron Howard-directed film also stars Renee Zellweger. Howard has admitted that Crowe's fiery temperament made for a difficult working environment on set. "Working with Russell is like shooting on a tropical island," he said. "You know the weather is going to change. Russell is an intense guy. It might look like clouds have rolled in. "It might get tense for a second. But the sun will shine."